Princess Tiana’s Showboat Jubilee officially premiered yesterday at the Magic Kingdom (though we brought photos and video to you from it’s first public performance the day before!) Princess Tiana was also officially inducted as one of the princesses in a ceremony in front of Cinderella Castle. 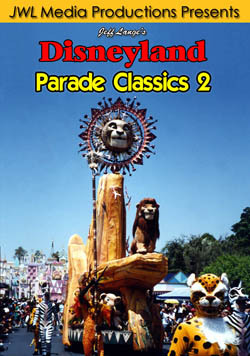 The cast from Tiana’s Showboat Jubilee led the procession (below, left). Characters and the other princesses wait for Princess Tiana to arrive (below, right). Princess Tiana arrives in a horse-drawn carriage (below, left). The cast listens while a proclamation is read (below, right). Princess Tiana reacts (below, left). Performers lead the way for Tiana back down Main Street USA once she’s officially a Disney princess (below, right). Media and guests were treated to an early showing of Tiana’s Showboat Jubilee (below left and right). Girls dressed as Tiana (made up at the Bibbidi Bobbidi Boutique, which debuted the new dresses two weeks ago) pose for the camera (below, left). Bruce Smith, lead animator for Dr. Facilier poses with the Liberty Belle in the background (below, right). We were able to speak with him for about 10 minutes, he’s very excited about this movie! 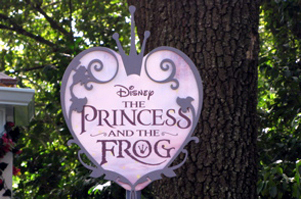 Dara Trujillo, Merchandise Manager for Walt Disney World Resort poses with her favorite product (kissing magnetic frogs) in the new Princess and the Frog line (below, left). Other merchandise was also displayed, including this Princess Tiana shirt (below, right). Yesterday also marked the debut of the Princess Tiana and Prince Naveen meet and greet. A sign was placed in front of the new gazebo (below, left). Prince Naveen and Princess Tiana make their entrance (below, right). The gazebo was constructed between Sunday and Monday, and was ready for Princess Tiana (below, left). Princess Tiana and Prince Naveen greet their guests (below, right). Video #1 – Princess Tiana Inducted as a Princess, Magic Kingdom 10/26/2009 – Princess Tiana is inducted as Disney’s newest princess at Walt Disney World’s Magic Kingdom! Video #2 – Princess Tiana and Prince Naveen Meet and Greet, MK Disney World – This is the new meet and greet – it debuted today, with Princess Tiana and Prince Naveen in Liberty Square. I have recently released the latest edition of my Trick or Treat series featuring the 2009 Mickey’s Not So Scary Halloween Party!